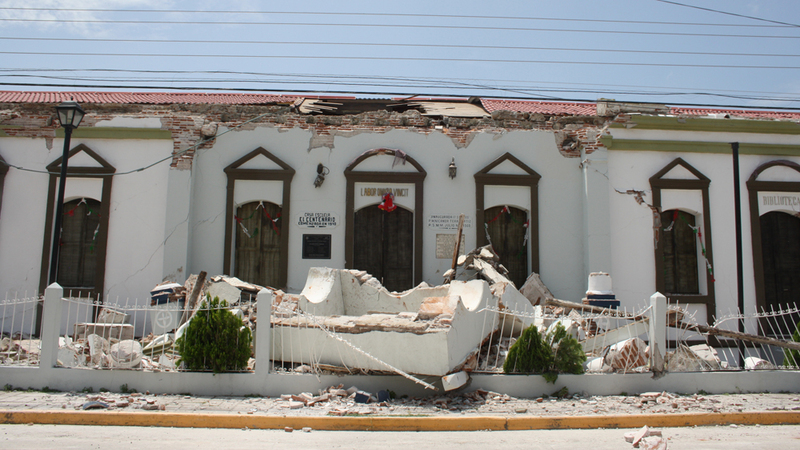 On September 7, Mexico and Guatemala experienced the most destructive earthquake since the eighteenth century. Whereas Mexico City remained almost intact, the areas closer to the epicentre, including Oaxaca, Chiapas and Guatemala, suffered incredible damages. Media coverage of the issue has been quite poor, to be honest, focusing primarily on Juchitán, an important economic Zapotec centre, while ignoring the surrounding Indigenous communities. Also, media coverage in the West has found, not surprisingly, incredibly colonial, gendered and exotifying ways of tying my nation’s gender and sexual dynamics (as perceived by Westerners) into the framing of the earthquake, which is not only annoying, but incredibly angering. Members of my family have lost homes and livelihoods in the past few days, and while the argument goes that “at least people are alive,” material things, like homes, are essential to living safely. We continue to wait to know what the extent of the damages to houses, roads, hospitals and the communities are. We also continue to wait for support in the forms not only of immediate relief, but long-term reconstruction. Asunción Ixtaltepec, my family’s hometown via Al Jazeera. In all this, the very-well publicized (in often orientalist and exotifying ways, even by Muslims!) Tzozil Muslim community in Chiapas is nowhere to be seen in the media. From a Mexican perspective, this is not surprising. Indigenous communities in Chiapas rarely make it to the media unless it is in the context of conflict and armed dissent led primarily by Zapatista communities, and often in very negative ways. But even Al-Jazeera, which has in the past covered Muslim communities in Chiapas, seems to have completely forgotten about them. Overall, for decades Indigeneity has disturbed not only the media and governments, but mainstream Muslim communities (primarily non-Black Muslim communities), which have been slow to address the needs of those who are considered to be outside the fold of Arab or South Asian Muslimness, even in cases of emergency connected to climate change and its effects. I am not talking about Mexico only, with its small Muslim community. But in the past few decades the struggles of several Indigenous communities (themselves Muslim or in Muslim-majority settings) have been often ignored or brushed away. In Egypt, for instance, the Nubians heavily fought the Aswan High Dam, which flooded their traditional lands, displaced many and has continued to impact their communities. Marsh Arabs in Iraq continue to live with the aftermath of the Iraqi government’s decision to divert the Tigris and Euphrates rivers in the 1990s; the ecological impacts have further affected the lives of Marsh Arab women. In Syria, climate change expressed in the form of extensive draught has forced Bedouin communities to move to urban centres, which are now under attack. Their presence in the conflict is also often erased. In Kenya, Turkana communities have been displaced by draught, floods and development projects aiming to benefit urban communities in Kenya; displacement is often accompanied by health issues, particularly for the most vulnerable. Palestinians have also been strongly hit by climate change, particularly in a setting where their territories continue to be occupied and they have little control over natural resources. And many can be added in every single country in the world. In Latin America climate change is proving deadly to Indigenous communities, which in the past two decades have been further resisting the presence of Canadian mining companies benefiting the mainstream Canadian economy (primarily enjoyed by white settlers, but not exclusively). And of course, Indigenous communities across the continent, including in Canada and the US, have been fighting environmental policy, resource extraction and displacement by settlers and mainstream populations. In the Canadian context, many of those who benefit from resource extraction and the displacement and marginalization of Indigenous peoples are Muslims. In fact, Muslim history in Canada is intrinsically connected to anti-Indigeneity and violence against Indigenous and Black bodies through slavery, colonization and immigration. This, of course, has a gendered side too. The burdens of climate change are particularly carried by Indigenous women and non-binary folks. Climate change and its relationship to capitalist systems have and continue to disturb Indigenous notions of collective rights, and the roles of women and non-binary people within their communities. In addition, resource extraction and the removal of Indigenous peoples from their traditional territories (those who have one), are closely tied to sexual violence experiences among Indigenous women and non-binary folks. Climate change has also driven a lot of women not only into urban settings seeking work, but across borders where they are further at risk of experiencing violence. Also, water protection is essential to Indigenous women in the Americas, for instance, not only because it guarantees the survival of their communities, but because water is crucial to whom we understand ourselves to be, in some communities. Poverty, closely tied to climate change and resource extraction and settler colonialism, puts Indigenous women at risk of violence, including forced marriages, trafficking and criminalization. This same capitalist driven poverty and climate change effects erase non-binary folks from the map completely, which results in incredible experiences of violence. Finally, in settler contexts, Indigenous women and non-binary folks live in violence. When climate change expresses itself in the forms of earthquakes, floods, draught, etc., it is women and non-binary people that more likely to lose everything, to not acquire any aid, to be left with the burden of carrying for the vulnerable and to not even be looked for by governments, when missing. Hence, Muslim silence when it comes to Indigenous issues, gender and climate change, in the West or elsewhere, baffles me. My sense, sometimes, is that we are not quite ready, as Muslim communities (particularly in the West), to talk about the intersections of climate change, Indigeneity, Blackness and Islam. To open that can of worms requires many of us to question our class, racial, gender and white privilege and to change many of our everyday practices. In a context where climate change affects primarily Indigenous communities (many of them Black) across the globe, Muslims should be having a two-folded conversation regarding the issue. First, we should be discussing our role in climate change activism and advocacy while countering capitalism, gendered violence, homophobia and white supremacy because these are not disconnected. Second, we should be looking at the ways in which settler Muslims and non-Indigenous Muslims have an obligation to the Indigenous peoples of the territories where they reside, which includes understanding that our presence on Indigenous land inherently disturbs Indigenous territories and rights, as well as their access to resources. We can be in solidarity with each other, but privilege must be recognized. Further, these two pieces of the conversation should conclude on asking, how do we help, assist and resist with Indigenous communities when emergencies, such like a massive earthquake, hit? In all this, it is important to recognize that Indigenous peoples, particularly Black Indigenous folks and/or Two-Spirited people, around the globe are the most impacted by climate change. For starters, people tell us, “the good thing is you are alive!” even though our right to life is constantly questioned in settings where Indigenous peoples are said to be “backwards,” “uncivilized” and a “threat to development.” This is often what non-Indigenous Muslims hear first about Indigenous peoples wherever they are. Hence, in the context of thinking what climate change and natural disasters entail for my own Indigenous community, for Indigenous Muslims and Indigenous peoples in Muslim-settings, I believe there is more work that has to be done in terms of thinking what are our responsibilities as Muslims to Indigenous peoples, particularly Indigenous women and non-binary folks. Whereas examples of solidarity exist, for instance Muslim presence in Standing Rock (Nation of Islam and Palestinians primarily) and the most recent Women for Water Project in Canada, the work requires overall rethinking of the relationship between climate change, indigeneity, gender and Islam. Such an insightful article on a very important matter. I like how you combine various important issues together and make it known that Muslims should become more active and aware of our role in the upholding of destructive capitalist practices and views, as well the privileges we have within this hierarchical system of oppression. And finally I wish to say that my prayers are with your family at this time as they recover from the earthquake. May they recover quickly and completely.